Beautiful Irish women have a typical appearance. They are the owners of bright red hair, freckles and eyes of blue color. Even though the ancestors of the Irish Celts were scorching brunettes, they loved to paint hair in red color. Irish women are very good-natured, friendly and responsive. Indeed, the girls like talking, it's very easy to become acquainted with them. Extreme sociability and curiosity are their national characteristics. Irish women love dancing, singing and do some writing - for example, the verses. They love to spend their time having fun at festivals and competitions of folk and modern dances, fairs, carnivals city. In Ireland, most of the girls are very late getting married and not because they want at first gain independence, but they simply are not ready to take responsibility in front of family and child-rearing. Results of early marriages are single mothers. A huge number of irish women here also have whose couples go abroad to work for a long period and may stay in a distance from home. The son in Ireland will never lead to the mother's house his bride or even a wife, because then the family will have two mistresses, and the mother will no longer be the sole authority, leading the household. In Ireland, young people can dating for a few years, not registering their relationship, and when they have collected enough financial resources to purchase a separate housing, then they can seriously talk about the marriage. Irish women have no rights to the financial savings that are common, or even her own. While she is married, all financial matters are remained for a man. Woman in Ireland can only rely on tools that spouse may allocate her something to keep house and children. Even if all the savings, which is the family, earned by a woman and a man has nothing to do for it, the wife still can not use these tools to solve her issues without her husband's permission. This is indicative of some infringement of Irish women, which limits not only their freedom, but also puts a few steps below the men, even if the females take a higher position in society than their husbands and get a bigger salary. 22. Rose McGowan (5 September 1973) - American actress and singer, having Irish and French roots. 21. Lynn Kelly (26 May 1989) - Irish model, winner of the title "Miss Universe Ireland 2008". 20. Emma Waldron (1989) - Irish model, winner of the title "Miss Ireland 2010", "Miss World Europe 2010". 19. Nadine Coyle (15 June 1985) - British-Irish singer. 18. Laurena Lacey (29 April 1986) - Irish model. 17. Suzanne McCabe (1991) - Irish model. 16. Coco Rocha (10 September 1988) - Canadian supermodel Russian-Irish descent. 15. Heather Graham (29 January 1970) - American film and television actress from a family of Irish descent. 14. Anne Hathaway (12 November 1982) - American actress having Irish and French roots. 13. Katie McGrath (24 October 1983) - actress and model. 12. Rebecca Maguire (1990) - Irish model, winner of the title "Miss Ireland 2012". 11. Bridget Moynahan (28 April 1971) - American model and actress, borning in a family with Irish roots. 10. Rozanna Purcell (3 September 1990) - Irish model, "Miss Universe Ireland 2010". 9. Mischa Barton (24 January 1986) - Anglo-American actress and model. She has Irish roots on his mother's side. 8. Tanya Trianta (8 February 1989) - Irish model with Greek-Irish roots. 7. 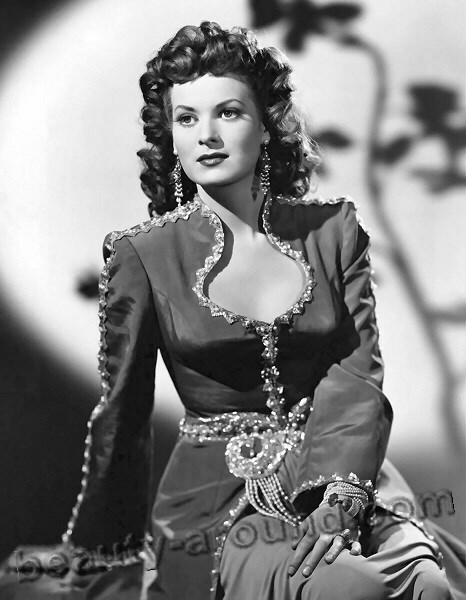 Maureen O'Hara (17 August 1920) - Irish actress and singer. 6. Sharon Corr-Bonnar (24 March 1970) - Irish singer, songwriter, pianist and actress. 5. Holly Carpenter (1991) - Irish model, winner of the title "Miss Ireland 2011". 4. Minka Kelly (24 June 1980) - American actress, having New Zealand and Irish roots. 3. Rose Byrne (24 July 1979) - Aistralian actress, from a family of Irish and Scottish descent. 2. Olivia Wilde (10 March 1984) - American actress. 1. Rosanna Davison (17 April 1984) - Irish model, winner of the title "Miss Ireland 2003", "Miss World 2003".